To analyze the acoustics of this case, in order to determine if the state witnesses would have heard the screams if they came from Oscar’s toilet with a closed window, there are two critical parameters about which assumptions have to be made. These are: 1) How loud would Reeva have screamed, and 2) what were the ambient noise levels within the bedrooms of the witnesses? Ambient noise is also called “background noise”. It is typically the noise caused by ventilation systems, traffic, refrigerators, etc. Please read “How loud can a woman scream?” for our argument that the defence’s assumption that Reeva would have screamed at a sound level of 110 dBA was a lazy overly conservative assumption made only to assist Oscar’s version. This post looks at the second parameter – ambient noise levels. Ivan Lin, the acoustic engineer employed by the defence to assist Oscar, assumed a range of 20 to 45 dBA for the ambient noise level. Note that he does not say that he actually measured the ambient noise level inside this specific estate at about 3 o’clock in the morning. Why didn’t he? We know that the defence was in the Estate on several occasions to conduct tests with people arguing and screaming inside Oscar’s house. It would have been a simple and small task to measure the actual ambient sound levels. Also note that he did not use a similar range of values for the loudness of a scream. Why use a fixed value of 110 dBA while he could have done his analysis for a realistic range – e.g. 110 to 120 dBA? The answer to this is quite simple: the defence could not allow a 120 dBA scenario to be analyzed as this would have been very detrimental to their case. The range of 20 to 45 dBA is so large that for all practical purposes it is really of no use to assist the court. Let’s try and narrow it down a bit. 45 dBA – With Advocate Barry Roux talking. It should be clear that neither of the two scenarios above are representative of a bedroom (without air condition or fans running) nor a balcony at about 3 am in a sparsely populated residential estate. We can can thus safely conclude that the ambient sound level was less than 40 dBA. The table above show typical sound levels for different land-use scenarios (derived from source data at Engineering Toolbox). The estate is situated in close proximity to the Farms Inn nature reserve and was at the time relatively sparsely populated. It is therefore not unreasonable to assume that the ambient noise level would have been between 30 and 35 dBA. Therefore in our acoustical analysis elsewhere on this website we will use a conservative 35 dBA. The table above also shows the frequency spectrum of typical ambient noise for different land-use scenarios. It is evident that for typical background noise with a sound level of 35 dBA the sound level within the 2000 Hz octave is only 24 dBA. The reason why we emphasize the 2000 Hz octave here is because this is the octave in which a typical female scream has most of its intensity. The reason why it is important to consider the ambient sound level is because if it is high enough it can “mask” a sound (voice, scream, etc.) and render it inaudible and unintelligible. An important parameter here is the signal-to-noise ratio (SNR). The SNR is the difference between sound level and the ambient noise level. A minimum SNR of about 6 dBA is required for sound to be audible and intelligible above ambient noise, while 10 dBA to 15 dBA is ideal. However according to McLain (2015), in the majority of real-world listening conditions, people can recognize speech with an SNR that commonly ranges from –10 to +5 dB. When one superimposes the profile of say a scream (in green) over the profile of ambient noise (in red), portions of the scream’s profile will be above the ambient profile, even when the overall ambient sound level may be higher than the overall sound level of the scream. The portion/s of the scream’s profile that is more then about 6 dBA above the ambient profile (green shaded area) will be audible – and this is often sufficient to make the scream/voice audible – especially when the frequencies that exceed the corresponding ambient levels are those frequencies that the human ear are typically most sensitive to. That is why people can recognize speech in real world listening conditions where the SNR is below zero. 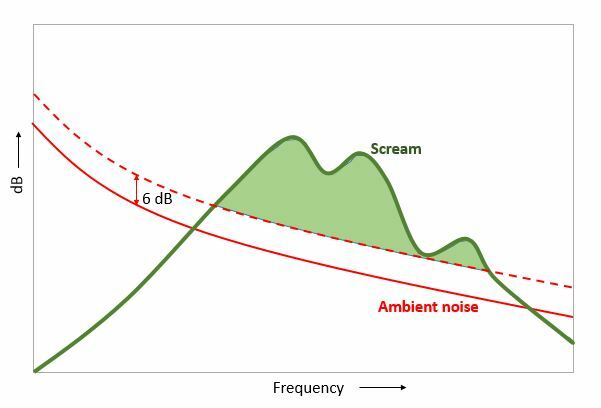 Ultimately it comes down to this: in order to assess the audibility of a scream above the ambient noise levels (especially when SNR values are small or less than zero) one also has to consider the SNR’s within each octave band. The defence’s expert did not do this. ← How well did the Stipps hear? Get the"Oscar vs The Truth" eBook for only ZAR 150 (about 11 USD, 8.3 GBP). Did Oscar lie about the small fan? Did Oscar admit his own guilt? The Black Vest – Where is the Bullet Hole? How did the State lose?